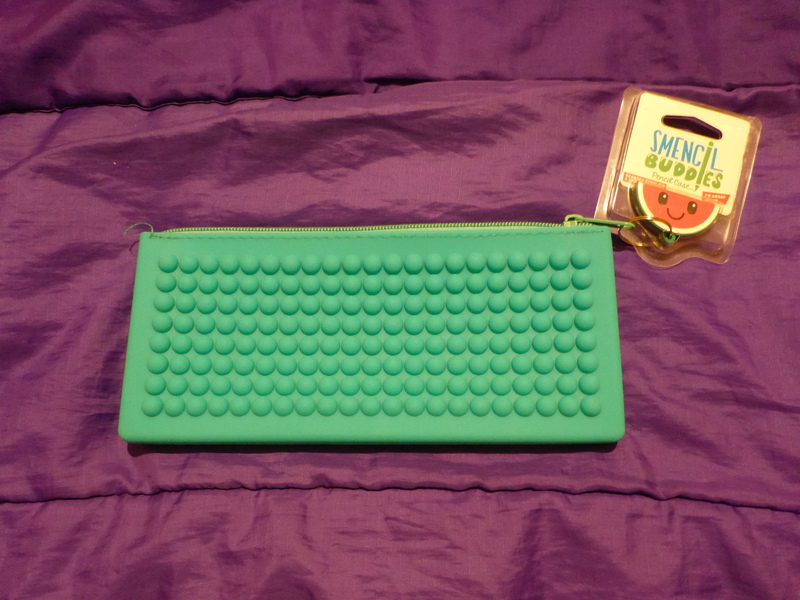 Image Description: an image of a Smencil Buddies Pencil Case (watermelon flavour), it’s a teal-green pencil case with eight rows across of raised bumps decorating the outside of the pencil case. Attached to the zipper is a small decorate key-ring that resembles a slice of watermelon with a smiley face on it. 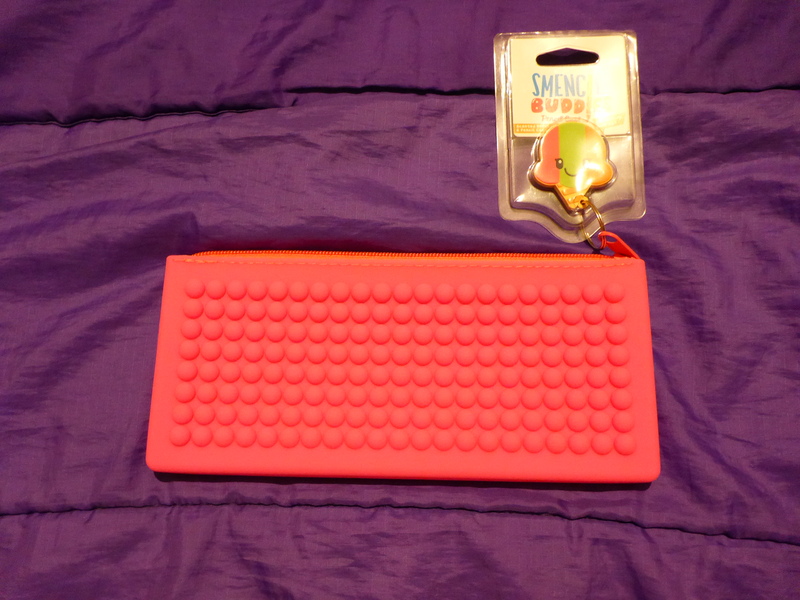 Image Description: an image of a Smencil Buddies Pencil Case (rainbow sherbet flavour), a bright-pink pencil-case with eight rows across of raised bumps decorating the outside of the pencil-case. 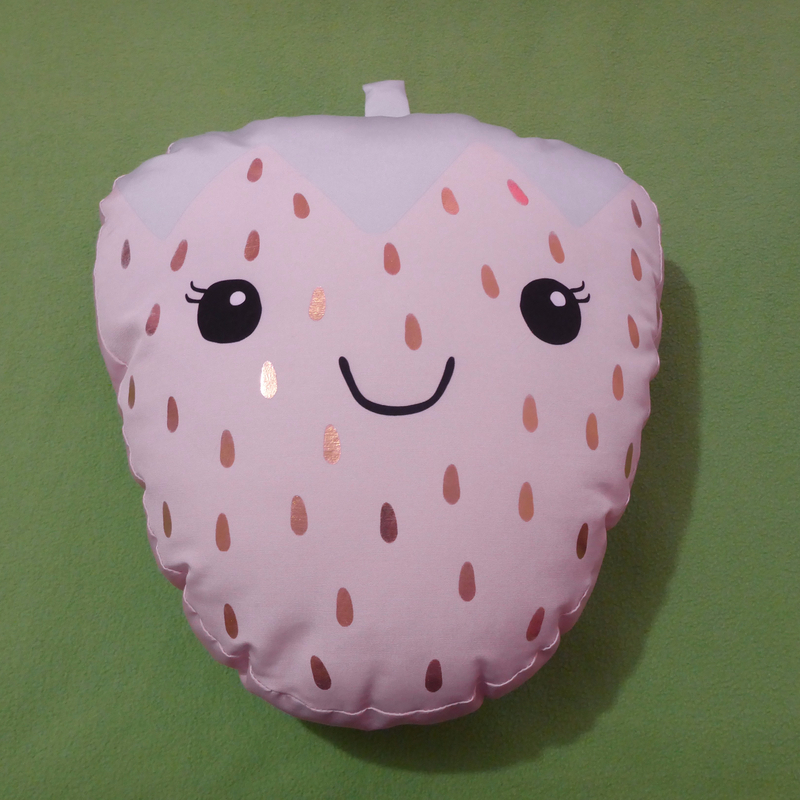 Attached to the zipper is a small decorate key-ring that resembles an ice-cream cone (it has three colours: pink, green and orange) with a smiley face. I was planning on using these items as part of my Diverse Reading Challenge Giveaway, but as they turned out to be scented items, I decided against it. The problem with scented items is that there’s just too much risk and variation (what I find enjoyable may just give someone else a headache), however, I figured I may as well do a review of these anyway. 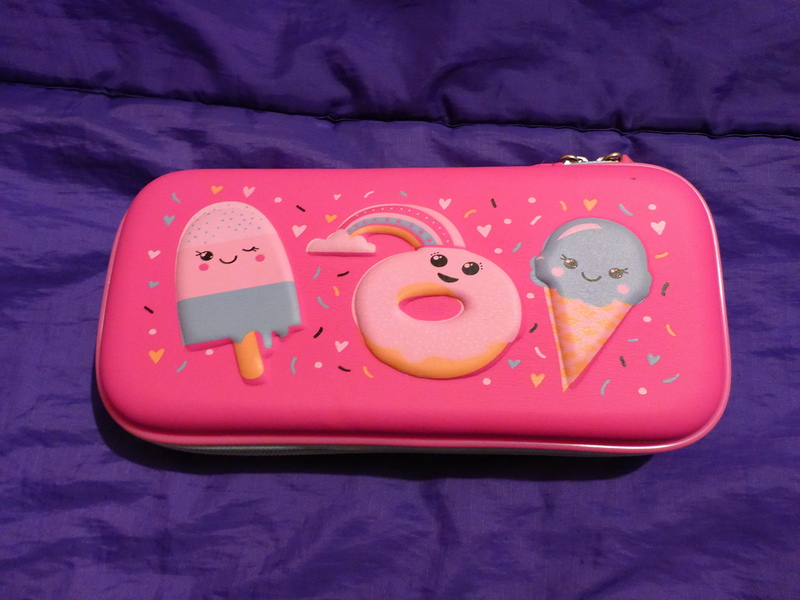 The Ice-cream pencil case is reasonably sized (by my standards) and it contains a rainbow collection of pens I bought from Daiso and a collection of glitter pens and metallic gel pens I bought from Aldi. 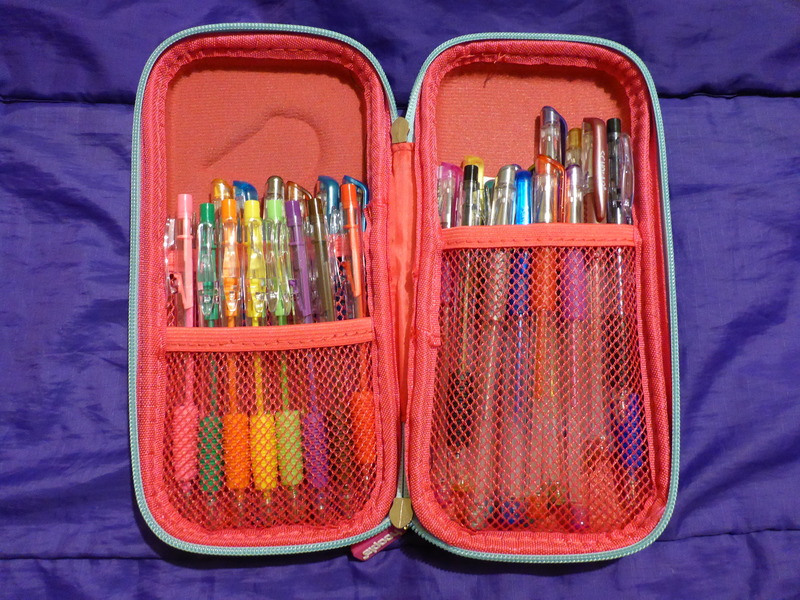 While I managed to squeeze all those pens into the Rainbow Sherbet pencil case, the result was a little concerning, and it looked like it would explode any minute. So, as a pencil case, I would probably consider it too small (but it this could just be me), however, it’s size should make it okay to use as a Stim Toy Case, but due to the fact that it’s a scented item and thus not recommended for public use due to chemical sensitivities, I wouldn’t consider it practical. But it feels so good to touch, the knobbly parts are great to run your fingers over, and I also enjoy the smooth side as well. I really like the Rainbow Sherbet one, and I’m probably going to keep it for myself, despite the fact that I know it’s completely impractical. 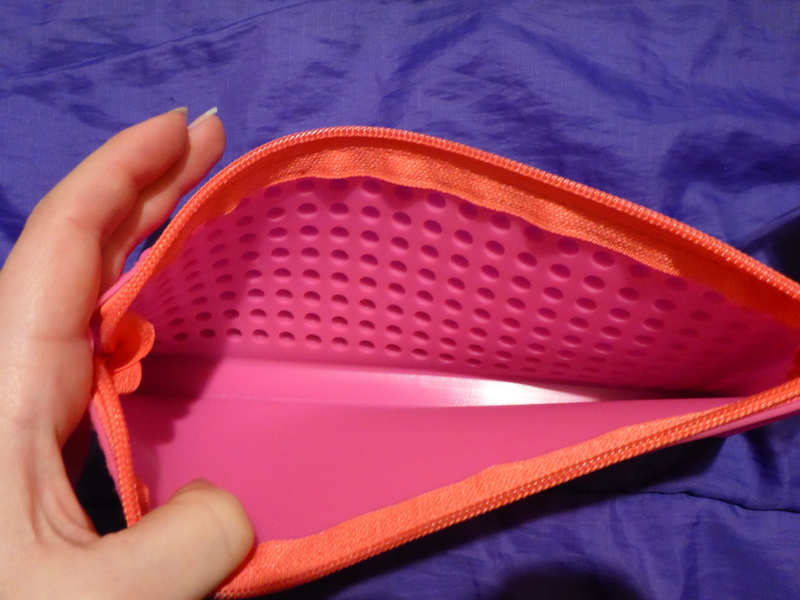 If you’re interested in tactile pencil cases or coin purses that aren’t scented, I would be happy to recommend Yoobi Fuzzy Pencil Cases (they come in blue, purple, pink, green, and aqua) and Yoobi Fuzzy Coin Purses (they come in aqua, pink, blue, and green). In Australia, you can buy these items from their website or from Officeworks, although pricing does vary depending on location.